This quick, straightforward dish of eggs cooked in a Turkish style with a hit of paprika, fennel seeds and cayenne pepper makes a light supper but is still full of flavour and excitement. Preheat the oven to 180°C/gas 4 and oil 2 shallow, ovenproof dishes. Wash the spinach, shake dry and roughly chop. Put a dry, non-stick frying pan over a high heat and toss the spinach until wilted. Remove it and squeeze out any excess water. Toss with the olive oil, season and divide between the dishes, spreading it out into two nests in each dish. Break 1 egg onto each spinach nest, and bake for 10–15 minutes until the whites have set and the yolks are still runny. Beat the garlic into the yogurt and season well. Spoon it over the eggs and scatter with the fennel seeds. Dust with the paprika and cayenne pepper before serving. 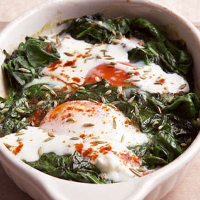 Spinach and eggs are both wine-challenging. Australian pinot grigio is gentle enough to accommodate both and add charm of its own, too.